REDDING, Calif. - Growing up, Jeffrey Arndt was unable to attend both his eighth grade and high school graduations. 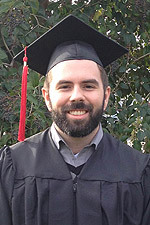 On Saturday, Jan. 10, he participated in his first-ever graduation ceremony, where he received his B.A. in organizational leadership from Simpson University’s School of Adult Studies ASPIRE degree-completion program. He also became the first member of his family to earn a bachelor’s degree.